Hannah Gadsby's 'Nanette' Is A Scorching Piece On Comedy And Trauma Hannah Gadsby, an Australian comedian, has a Netflix special that talks about the construction of jokes, the pain of self-deprecation, and what we owe to ourselves and the people who hear our stories. 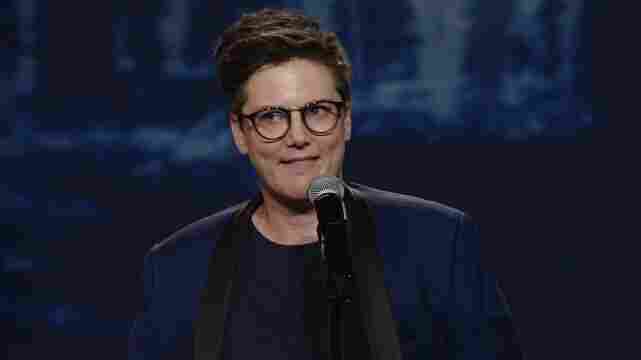 Hannah Gadsby has brought her live show Nanette to Netflix. Many Americans had little exposure to Australian actress/comic/writer Hannah Gadsby before a few weeks ago. Maybe they had seen her in Please Like Me, an Australian comedy series in which she had a supporting role. But statistically, they probably hadn't. And then came Nanette, her Netflix special, which is a recording of a live show she's been doing for a while — it won awards at Edinburgh Festival Fringe and the Melbourne Comedy Festival — and brought to New York in March. If you look at some of the tweets about Nanette, you'll see a lot of people using very strong words of praise for it. Well, Hannah Gadsby's "Nanette" special on Netflix lived up to all the hype my friends had given it. Wow. So what is Nanette anyway? It is stand-up ... sort of. It is comedy ... partly. Netflix has been producing a fire hose of content of all kinds over the last several years, and they have fixed their gaze hard upon the world of stand-up. This has meant they've landed specials from the very famous side of American comedy — people like Jerry Seinfeld, Chris Rock, Patton Oswalt, and Amy Schumer. But Netflix has also allowed space for comics who aren't yet superstars when they first arrive there: Ali Wong, Hasan Minhaj and others. Still, this is different. Not a little different, but totally different. First things first: Gadsby says, when she walks out on stage in dark pants, a dark shirt, and a blue blazer with black lapels, that she called the show Nanette because she'd met someone named Nanette, and she hadn't yet written the show and she just figured she could get an hour of comedy from that person. "Turns out," she says, "No." This little opening gag, while it's funny and gets a laugh, communicates something that will recur: a framing in which the show is being written, its themes discovered, as it's performed — which obviously is not so, and which you are not meant to literally believe is so. But suggesting that the show disobeyed the name she gave it lays out one of Gadsby's themes with great economy: that writing and performing will sneak up on you. Not just as the audience, but as the creator. That you are not always doing what you think or hope you're doing. Gadsby begins with a riff on what it was like, as a kid growing up in Tasmania, when she "found out [she] was a little bit lesbian." The general attitude, she says, was that gay people were not welcome: "You should just get yourself a one-way ticket to the mainland, and don't come back," she summarizes, and because of the way she delivers the line, the audience laughs. And you begin to see a very particular look, which you'll see on and off over the hour: a tight grin, framed by Gadsby's dimples, topped by her upper lip almost baring her teeth, that is not quite a smile. It's not the relaxed smile you see when she jokes about penicillin or something else less personal. Once you've seen the entire special, this look makes sense, because it calls upon you to ask: What, exactly, is funny about feeling unwelcome in your own country because of who you are? What, as she continues in another anecdote, is funny about being angrily confronted by a man who believed she was another man hitting on his girlfriend? The humor is in the way she tells it; the humor is her choice. She is making the decision to make it comedy. She could make another choice instead. She wanders, at times, into actually analyzing how jokes work: How they create tension (the set-up) and then release it (the punch line). How she learned to be funny because she needed to release tension to survive. It was not, at that time, tension she built as a performer, but tension that she represented for other people, because of who she was. She talks about the mythology of trauma and pain as the ways to make art — not just comedy, but visual art, too (you will never hear so much about Van Gogh and Picasso in any other Netflix comedy special). One of the things Gadsby is doing is exploring tools for telling stories, particularly stories of trauma. She is questioning not the power of laughter or comedy, but the way in which queer performers and anyone else who feels different are encouraged to come to comedy, pain in hand, pain as punch line. She is questioning what kind of art we accept from what kind of artist, and how creativity and pathology are romantically entwined in popular myth. The special is funny, in many places, and when it isn't, it is not dully didactic but blisteringly insightful. It is serious, but it is never dry — it is riveting throughout. What happens, she wonders, to the things we make into jokes? How permanent is the relief of shared laughter? These are daring, fresh questions that demolish the very idea of reflexive glibness in comedy and art and fearlessly present not saccharine sincerity but unapologetic emotion as worthy of being heard. It's part of the show to watch it bend and reshape itself, so I don't want to say too much more about it. Suffice it to say there is a reason why people are so urgently telling the people they know to watch it. It has all this, after all, plus what I suspect will be 2018's best fart joke. Hannah Gadsby might tell you I said that last thing to release the tension of talking about how wrenching her show is, and that maybe I shouldn't have. She might be right.